4 row choker made with a antiqued carved bone hair pipes & carved antiqued bone spacers with brass colored metal round beads & leather laces. This choker also features a black round bone center piece with bone dangles. 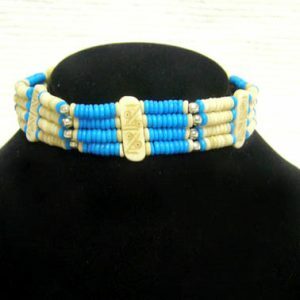 These chokers have become quite popular & are surprisingly good quality for so little money.